Porphyria is any of the rare genetic disorders characterized by defects in various enzymes in the chain of chemical reactions that produce heme, and thus the abnormal production of this essential chemical compound and the toxic accumulation of certain porphyrins (group of organic compounds) or related chemicals in the patient. In this group of diseases (porphyrias), the predominately inherited, but occasionally acquired, metabolic errors and buildup of porphyrins manifest with either neurological complications ("acute") or skin problems ("cutaneous"), or occasionally both. In addition to being classified according to symptoms (acute and cutaneous), porphyrias may be grouped according to the primary site of the overproduction and accumulation of the porphyrins (or their chemical precursors). Hepatic porphyrias are where porphyrins are overproduced in the liver predominantly; erythropoietic porphyrias are where the overproduction is confined to the bone marrow and the erythrocye (red blood cell) and its precursors. The rarity of this disease shows the normal remarkable harmony in the body, where the genes for each enzyme normally are accurately replicated and folded correctly, and the enzymes plug harmoniously into a complicated chain to produce the heme group. Such factors as alcohol consumption, smoking, stress, certain drugs, and fasting can all influence the severity and the appearance of the symptoms of porphyria. The various diseases known as porphyrias share a common feature: certain enzymes in the heme bio-synthetic pathway (also called porphyrin pathway) have a genetic defect and this results in abnormal accumulation of porphyrins. Porphyrins are a group of organic compounds, many of which have the iron-containing heme as their prosthetic group. Those with heme as their prosthetic group are known as hemoproteins, such as hemoglobin. Heme is vital for all organs; it is most abundant in the blood, liver, and bone marrow. Porphyrins are heterocyclic macrocycles composed of four modified pyrrole subunits interconnected at their α carbon atoms via methine bridges (=CH-). Porphyrins are aromatic. The parent porphyrin is porphine, and substituted porphines are called porphyrins. There are eight different enzymes involved in the chain of chemical reactions that produce heme. When there are deficiencies in these enzymes in the heme pathway, the result is a buildup of heme precursors (porphyrins) and the family of disorders known as porphyria, and in particular this is associated with deficiencies in the second to eighth enzyme. The term porphyria derives from the Greek πορφύρα, porphyra, meaning "purple pigment". The name is likely to have been a reference to the purple discoloration of feces and urine when exposed to light in patients during an attack. Although original descriptions are attributed to Hippocrates, the disease was first explained biochemically by Felix Hoppe-Seyler in 1871, and acute porphyrias were described by the Dutch physician Barend Stokvis in 1889. The two major types of illness are skin lesions (cutaneous) and nervous system attacks (acute). The two major groups are erytheopoietic porphyrias (where the porphyrins are synthesized in the bone marrow) and hepatic porphryias, where the porphyrins are synthesized in the liver. The worldwide prevalence of porphyria has been estimated to be somewhere between 1 in 500 to 1 in 50,000 people.. In the United States, the prevalence of all types of porphyria taken together has been estimated to be approximately 1 in 25,000. Subtypes of porphyrias depend on what enzyme is deficient. uroporphyrinogen (URO) synthase Congenital erythropoietic porphyria (CEP) Erythropoietic Autosomal recessive  Severe photosensitivity with erythema, swelling and blistering. Hemolytic anemia, splenomegaly 1 in 1,000,000 or less. In humans, porphyrins are the main precursors of heme, an essential constituent of hemoglobin, myoglobin, catalase, peroxidase, respiratory and P450 liver cytochromes. 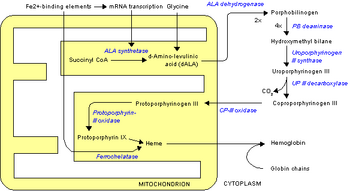 Deficiency in the enzymes of the porphyrin pathway leads to insufficient production of heme. Heme function plays a central role in cellular metabolism. This is not the main problem in the porphyrias; most heme synthesis enzymes&mdasheven dysfunctional enzymes—can have enough residual activity to assist in heme biosynthesis. The principal problem in these deficiencies is the accumulation of porphyrins, the heme precursors, which are toxic to tissue in high concentrations. The chemical properties of these intermediates determine the location of accumulation, whether they induce photosensitivity, and whether the intermediate is excreted (in the urine or feces). There are eight enzymes in the heme biosynthetic pathway, four of which—the first one and the last three—are in the mitochondria, while the other four are in the cytosol. Defects in any of these can lead to some form of porphyria. The hepatic porphyrias are characterized by acute neurological attacks (seizures, psychosis, extreme back and abdominal pain and an acute polyneuropathy), while the erythropoietic forms present with skin problems, usually a light-sensitive blistering rash and increased hair growth. Variegate porphyria (also porphyria variegata or mixed porphyria), which results from a partial deficiency in PROTO oxidase, manifests itself with skin lesions similar to those of porphyria cutanea tarda combined with acute neurologic attacks. All other porphyrias are either skin- or nerve-predominant. Porphyria is rare in all its forms and thus a physician may often overlook porphyria as the source of the symptoms, which can include such common features as nausea, vomiting, and abdominal disturbances. In addition there may be reddish urine and prickling sensations in the feet and hands. However, the main symptoms that distinguish porphyria are nervous system and skin effects, and at least four, with the notable exception of acute intermitten prophyria (AIP), can cause extreme photosensitivity of the skin, due to deposits of porphyrins in the skin, which are excited by the ultraviolet component of sunlight. The acute, neurovisceral, or hepatic, porphyrias primarily affect the nervous system, resulting in abdominal pain, vomiting, acute neuropathy, muscle weakness, seizures, and mental disturbances, including hallucinations, depression, anxiety, and paranoia. Cardiac arrhythmias and tachycardia (high heart rate) may develop as the autonomic nervous system is affected. Pain can be severe and can, in some cases, be both acute and chronic in nature. Constipation is frequently present, as the nervous system of the gut is affected, but diarrhea can also occur. Given the many presentations and the relatively low occurrence of porphyria, the patient may initially be suspected to have other, unrelated conditions. For instance, the polyneuropathy of acute porphyria may be mistaken for Guillain-Barré syndrome, and porphyria testing is commonly recommended in those situations. Systemic lupus erythematosus features photosensitivity and pain attacks and shares various other symptoms with porphyria. Not all porphyrias are genetic, and patients with liver disease who develop porphyria as a result of liver dysfunction may exhibit other signs of their condition, such as jaundice. Patients with acute porphyria (AIP, HCP, VP) are at increased risk over their life for hepatocellular carcinoma (primary liver cancer) and may require monitoring. Other typical risk factors for liver cancer need not be present. The cutaneous, or erythropoietic, porphyrias primarily affect the skin, causing photosensitivity (photodermatitis), blisters, necrosis of the skin and gums, itching, and swelling, and increased hair growth on areas such as the forehead. Often there is no abdominal pain, distinguishing it from other porphyrias. In some forms of porphyria, accumulated heme precursors excreted in the urine may cause various changes in color, after exposure to sunlight, to a dark reddish or dark brown color. Even a purple hue or red urine may be seen. Porphyria is diagnosed through spectroscopy and biochemical analysis of blood, urine, and stool. As most porphyrias are rare conditions, general hospital labs typically do not have the expertise, technology or staff time to perform porphyria testing. In general, testing involves sending samples of blood, stool and urine to a reference laboratory. All samples to detect porphyrins must be handled properly. Samples should be taken during an acute attack, otherwise a false negative result may occur. Samples must be protected from light and either refrigerated or preserved. In general, urine estimation of porphobilinogen (PBG) is the first step if acute porphyria is suspected. As a result of feedback, the decreased production of heme leads to increased production of precursors, PBG being one of the first substances in the porphyrin synthesis pathway. In nearly all cases of acute porphyria syndromes, urinary PBG is markedly elevated except for the very rare ALA dehydratase deficiency or in patients with symptoms due to hereditary tyrosinemia type I. In cases of mercury- or arsenic poisoning-induced porphyria, other changes in porphyrin profiles appear, most notably elevations of uroporphyrins I & III, coproporphyrins I & III and pre-coproporphyrin. Repeat testing during an attack and subsequent attacks may be necessary in order to detect a porphyria, as levels may be normal or near-normal between attacks. The urine screening test has been known to fail in the initial stages of a severe life threatening attack of acute intermittent porphyria. The bulk (up to 90%) of the genetic carriers of the more common, dominantly inherited acute hepatic porphyrias (acute intermittent porphyria, hereditary coproporphyria, variegate porphyria) have been noted in DNA tests to be latent for classic symptoms and may require DNA or enzyme testing. The exception to this may be latent post-puberty genetic carriers of hereditary coproporphyria. If all the porphyrin studies are negative, one has to consider pseudoporphyria. A careful medication review often will find the inciting cause of pseudoporphyria. Further diagnostic tests of affected organs may be required, such as nerve conduction studies for neuropathy or an ultrasound of the liver. Basic biochemical tests may assist in identifying liver disease, hepatocellular carcinoma, and other organ problems. Often, empirical treatment is required if the diagnostic suspicion of a porphyria is high since acute attacks can be fatal. A high-carbohydrate diet is typically recommended; in severe attacks, a glucose 10% infusion is commenced, which may aid in recovery. Hematin (trade name Panhematin) and heme arginate (trade name NormoSang) are the drugs of choice in acute porphyria, in the United States, and the United Kingdom, respectively. These drugs need to be given very early in an attack to be effective; effectiveness varies among individuals. They are not curative drugs but can shorten attacks and reduce the intensity of an attack. Side effects are rare but can be serious. These heme-like substances theoretically inhibit ALA synthase and hence the accumulation of toxic precursors. Heme Arginate (NormoSang) is used during crises but also in preventive treatment to avoid crises, one treatment every 10 days. If drugs or hormones have caused the attack, discontinuing the offending substances is essential. Infection is one of the top causes of attacks and requires immediate and vigorous treatment. Pain is severe, frequently out of proportion to physical signs and often requires the use of opiates to reduce it to tolerable levels. Pain should be treated as early as medically possible, due to its severity. Nausea can be severe; it may respond to phenothiazine drugs but is sometimes intractable. Hot water baths/showers may lessen nausea temporarily, though caution should be used to avoid burns or falls. It is recommended that patients with a history of acute porphyria, and even genetic carriers, wear an alert bracelet or other identification at all times. This is in case they develop severe symptoms, or in case of accidents where there is a potential for drug exposure, and as a result they are unable to explain their condition to healthcare professionals. Some drugs are absolutely contraindicated for any patients with any porphyria. Patients who experience frequent attacks can develop chronic neuropathic pain in extremities as well as chronic pain in the gut. Gut dysmotility, ileus, intussusception, hypoganglionosis, encopresis in children and intestinal pseudo-obstruction have been associated with porphyrias. This is thought to be due to axonal nerve deterioration in affected areas of the nervous system and vagal nerve dysfunction. In these cases treatment with long-acting opioids may be indicated. Some cases of chronic pain can be difficult to manage and may require treatment using multiple modalities. Opioid dependence may develop. Depression often accompanies the disease and is best dealt with by treating the offending symptoms and if needed the judicious use of anti-depressants. Some psychotropic drugs are porphyrinogenic, limiting the therapeutic scope. Seizures often accompany this disease. Most seizure medications exacerbate this condition. Treatment can be problematic: barbiturates especially must be avoided. Some benzodiazepines are safe and, when used in conjunction with newer anti-seizure medications such as gabapentin, offer a possible regime for seizure control. Magnesium sulfate and bromides have also been used in porphyria seizures, however, development of status epilepticus in porphyria may not respond to magnesium alone. Some liver diseases may cause porphyria even in the absence of genetic predisposition. These include hemochromatosis and hepatitis C. Treatment of iron overload may be required. Hormonal fluctuations that contribute to cyclical attacks in women have been treated with oral contraceptives and luteinizing hormones to shut down menstrual cycles. However, oral contraceptives have also triggered photosensitivity and withdrawal of oral contraceptives has triggered attacks. Androgens and fertility hormones have also triggered attacks. These are associated with accumulation of porphyrins in erythrocytes and are rare. The rarest is congenital erythropoetic porphyria (C.E.P) otherwise known as Gunther's disease. The signs may present from birth and include severe photosensitivity, brown teeth that fluoresce in ultraviolet light due to deposition of type one porphyrins and later hypertrichosis. Hemolytic anemia usually develops. Pharmaceutical-grade beta carotene may be used in its treatment. A bone marrow transplant has also been successful in curing CEP in a few cases, although long term results are not yet available. The pain, burning, swelling and itching that occur in erythropoietic porphyrias generally require avoidance of bright sunlight. Most kinds of sunscreen are not effective, but SPF-rated long-sleeve shirts, hats, bandanas and gloves can help. Chloroquine may be used to increase porphyrin secretion in some EPs. Blood transfusion is occasionally used to suppress innate heme production. Porphyrias have been detected in all races, multiple ethnic groups on every continent including Africans, Asians, Australian aborigines, Caucasians, Peruvian, Mexican, Native Americans, and Sami. There are high incidence reports of AIP in areas of India and Scandinavia and over 200 genetic variants of AIP, some of which are specific to families, although some strains have proven to be repeated mutations. The links between porphyrias and mental illness have been noted for decades. In the early 1950s, patients with porphyrias (occasionally referred to as "Porphyric Hemophilia") and severe symptoms of depression or catatonia were treated with electroshock. Porphyria has been suggested as an explanation for the origin of vampire and werewolf legends, based upon certain perceived similarities between the condition and the folklore. In January 1964, L. Illis' 1963 paper, "On Porphyria and the Aetiology of Werwolves," was published in Proceedings of the Royal Society of Medicine. Later, Nancy Garden argued for a connection between porphyria and the vampire belief in her 1973 book, Vampires. In 1985, biochemist David Dolphin's paper for the American Association for the Advancement of Science, "Porphyria, Vampires, and Werewolves: The Aetiology of European Metamorphosis Legends," gained widespread media coverage, thus popularizing the connection. The theory has since faced criticism, especially for the stigma it has placed on its sufferers. Norine Dresser's 1989 book American Vampires: Fans, Victims, Practitioners deals with this. The theory also operates on a flawed premise, mainly in regard to a perceived harmful effect sunlight had on vampires, a property relatively late to vampire belief. There are about eight different types of porphyria; four of these can sometimes cause sensitivity to light: Erythropoietic Protoporphyria (EPP) or Protoporphyria, Congenital Erythropoietic Porphyria (C.E.P. ), Porphyria Cutanea Tarda (PCT) and Variegate Porphyria. The mental illness exhibited by King George III, evidenced in the regency crisis of 1788, has inspired several attempts at retrospective diagnosis. One diagnosis, written in 1855, thirty-five years after his death, concluded he suffered from acute mania. M. Guttmacher, in 1941, suggested manic-depressive psychosis as a more likely diagnosis. The first suggestion that a physical illness was the cause of King George's mental derangements came in 1966, in a paper "The Insanity of King George III: A Classic Case of Porphyria", with a follow-up in 1968, "Porphyria in the Royal Houses of Stuart, Hanover and Prussia." The papers, by a mother/son psychiatrist team, were written as though the case for porphyria had been proven, but the response demonstrated that many, including those more intimately familiar with actual manifestations of porphyria, were unconvinced. Many psychiatrists disagreed with Hunter's diagnosis, suggesting bipolar disorder as far more probable. The theory is treated in Purple Secret, which documents the ultimately unsuccessful search for genetic evidence of porphyria in the remains of royals suspected to suffer from it. In 2005, it was suggested that arsenic (which is known to be porphyrogenic) given to George III with antimony may have caused his porphyria. Despite the lack of direct evidence, the notion that George III (and other members of the royal family) suffered from porphyria has achieved such popularity that many forget that it is merely a hypothesis. In 2010, an exhaustive analysis of historical records revealed that the porphyria claim was based on spurious and selective interpretation of contemporary medical and historical sources. The mental illness of George III is the basis of the plot in The Madness of King George, a 1994 British film based upon the 1991 Alan Bennett play, The Madness of George III. The closing credits of the film include the comment that the illness suffered by King George has been attributed to porphyria and that it is hereditary. Among other descendants of George III theorised by the authors of Purple Secret to have suffered from porphyria (based upon analysis of their extensive and detailed medical correspondence) were his great-great-granddaughter Princess Charlotte of Prussia (Emperor William II's eldest sister) and her daughter Princess Feodora of Saxe-Meiningen. They had more success in being able to uncover reliable evidence that George III's great-great-great-grandson Prince William of Gloucester was reliably diagnosed with variegate porphyria. 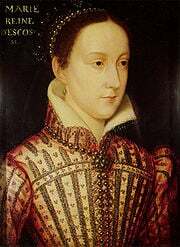 It is believed that Mary, Queen of Scots—King George III's great-great-great-great-great-grandmother—also suffered from acute intermittent porphyria, although this is subject to much debate. It is assumed she inherited the disorder, if indeed she had it, from her father, James V of Scotland; both father and daughter endured well-documented attacks that could fall within the constellation of symptoms of porphyria. Vlad III the Impaler, known by his patronymic name Dracula, was also said to have suffered from acute porphyria, which may have started the notion that vampires were allergic to sunlight. Other commentators have suggested that Vincent van Gogh may have suffered from acute intermittent porphyria. It has also been imagined that King Nebuchadnezzar of Babylon suffered from some form of porphyria (cf. Daniel 4). Paula Frías Allende, the daughter of the Chilean novelist Isabel Allende, fell into a porphyria-induced coma in 1991, which inspired Isabel to write the autobiographical book Paula, dedicated to her. ↑ 1.0 1.1 U.S. National Library of Medicine, "Porphyria," Genetics Home Reference (July 2009). Retrieved June 2, 2012. ↑ 2.0 2.1 2.2 2.3 V. S. Kanwar, "Porphyria, Cutaneous," MEDSCAPE July 27, 2010. Retrieved June 2, 2012. ↑ 3.0 3.1 N. Lane, "Born to the purple: The story of porphyria," Scientific American December 16, 2002. ↑ F. Hoppe-Seyler, "Das Hämatin," Tubinger Med-Chem Untersuch 4(1871): 523–33. ↑ B. J. Stokvis, "Over twee zeldzame kleurstoffen in urine van zieken," Nederl Tijdschr Geneeskd 2: 409–417. Reprinted in B. J. Stokvis, "Over twee zeldzame kleurstoffen in urine van zieken," Ned Tijdschr Geneeskd 133(1989) issue 51: 2562–70. PMID 2689889. ↑ 6.0 6.1 R. T. Klose, "Porphyria," Magill's Medical Guide, 4th Edition, Vol. IV (Pasadena, CA: Salem Press, 2008). ISBN 9781587653841. ↑ 7.00 7.01 7.02 7.03 7.04 7.05 7.06 7.07 7.08 7.09 7.10 7.11 7.12 Table 18-1 in D. B. Marks, T. Swanson, S. I. Kim, and M. Glucksman, Biochemistry and molecular biology (Philadelphia, PA: Wolters Kluwer Health/Lippincott Williams & Wilkins, 2007). ISBN 078178624X. ↑ The Porphyrias Consortium, "Aminolevulinic Acid Dehydratase Porphyria (ADP),", NIH Rare Diseases Clinical Research Network (2012). Retrieved June 3, 2012. ↑ N. C. Reynolds, [http://emedicine.medscape.com/article/1148341-overview#a0199 "Diseases of tetrapyrrole metabolism: Refsum disease and the hepatic porphyrias," Emedicine Feb. 3, 2012. Retrieved June 3, 2012. ↑ 10.0 10.1 10.2 10.3 10.4 H. Thadani, A. Deacon, and T. Peters, "Diagnosis and management of porphyria,".BMJ 320(2000), issue 7250: 1647–1651. PMID 10856069. ↑ 11.0 11.1 11.2 11.3 11.4 R. Arceci, I. M. Hann, and O. P. Smith, Pediatric Hematolog (Malden, MA: Blackwell Pub., 2006). ISBN 9781405134002. ↑ W. D. James, and T. G. Berger, Andrews' Diseases of the Skin: Clinical Dermatology (Saunders Elsevier, 2006). ISBN 0721629210. ↑ 14.0 14.1 H. Puy, L. Gouya, and J. C. Deybach, "Porphyrias," Lancet 375(2010), issue 9718: 924–37. PMID 20226990. ↑ J. W. Albers, and J. K. Fink, "Porphyric neuropathy," Muscle Nerve 30(2004), issue 4: 410–422. PMID 15372536. ↑ R. Roelandts,"The diagnosis of photosensitivity," Arch Dermatol 136(2000) issue 9: 1152–1157. PMID 10987875. ↑ K. E. Anderson, J. R. Bloomer, and H. L. Bonkovsky, et al., "Recommendations for the diagnosis and treatment of the acute porphyrias," Ann. Intern. Med. 142(2005), issue 6: 439–50. PMID 15767622. ↑ J. S. Woods, "Porphyrin metabolism as indicator of metal exposure and toxicity," pages 19-52 in R. A. Goyer, and M. G. Cherian, Toxicology of Metals, Biochemical Aspects Volume 115, Chapter 2 (Berlin: Springer, 1995) ISBN 3540582819. ↑ M. Faraci, G. Morreale, E. Boeri, et. al., "Unrelated HSCT in an adolescent affected by congenital erythropoietic porphyria," Pediatr Transplant 12(2008), issue 1:117–120. PMID 18186900. ↑ J. Denver, An Encyclopaedia of Obscure Medicine (University Books, 1959). ↑ I. Macalpine, and R. Hunter R, "The 'insanity' of King George 3rd: A classic case of porphyria," Br Med J 1(1966), issue 5479: 65–71. PMID 5323262. ↑ I. Macalpine, R. Hunter, and C. Rimington, "Porphyria in the royal houses of Stuart, Hanover, and Prussia. A follow-up study of George 3d's illness," Br Med J 1(1968), issue 5583: 7–18. PMID 4866084. ↑ J. C. G. Röhl, M. Warren, and D. C. Hunt, Purple Secret: Genes, "Madness" and the Royal Houses of Europe, (London: Bantam, 1998). ISBN 0593041488. ↑ The authors demonstrated a single point mutation in the PPOX gene, but not one which has been associated with disease. ↑ T. M. Cox, N. Jack,S. Lofthouse, J. Watling, J. Haines, and M. J. Warren, "King George III and porphyria: An elemental hypothesis and investigation," Lancet 366(2005), issue 9482: 332–335. PMID 16039338. ↑ T. J. Peters, and D. Wilkinson, "King George III and porphyria: A clinical re-examination of the historical evidence," History of Psychiatry 21(2010): 3–19. ↑ L. S. Loftus, and W. N. Arnold, "Vincent van Gogh's illness: acute intermittent porphyria?," BMJ 303(1991), issue 6817: 1589–1591. PMID 1773180. ↑ A. Beveridge, "The madness of politics," J R Soc Med 96(2003), |issue 12: 602–604 . PMID 14645615. ↑ I. Allende, Paula (New York, NY: HarperCollins, 1995). ISBN 0060172533. This page was last modified on 29 December 2014, at 17:29.